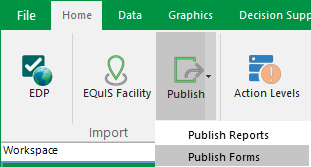 Forms provide a convenient method of viewing and interacting with EQuIS data. More information is provided in the Forms chapter of the Library help. Click the Forms button in the Open section of the Professional Home tab to access. 1.Click Publish, then Publish Forms in the Import section of the Home tab. 2.Click the Forms button on the Home tab, and then click Publish.